You are invited to join people all over the world in a hunger strike chain in solidarity with the mother of murdered Saharawi Mohamed Lamine Haidala. Haidala, a 21 year-old pro-independence activist, who died in February this year following a brutal attack by Moroccan settlers. His family report that rather than support Haidala in getting medical help, the Moroccan police arrested and detained him for two days and denied him medical treatment during this time. Following his release he was also subsequently refused medical care. He eventually died from his injuries eight days after the attack. The Moroccan authorities have denied Haidala’s family access to his body and they report being subjected to harassment and intimidation by the authorities. In May, Haidala’s mother Takbar Haddi staged a 36-day hunger strike demanding the Moroccan authorities release the body of her son. She temporarily ended the strike due to life-threatening health problems on June 19th and since then her hunger strike has been continued by supporters all over the world in 24-hour shifts, and publicised widely on social media. The chain started in Spain and has been continued by supporters in Western Sahara, the Canary Islands, Portugal, Kenya, Germany, Mexico, El Salvador, Algeria, Chile, Argentina, Italy and Uruguay. People in the UK are asked to join the strike for 24 hours on any day from 15th September and make a short video of themselves to be added to the campaign website. 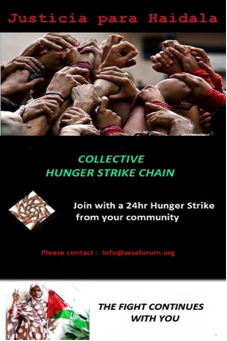 Contact info@wsaforum.org to commit your support. You can also sign the online petition asking the Moroccan Ministry of Justice and MINURSO to investigate Haidala’s death.